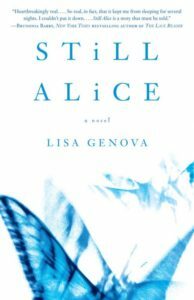 My book club picked Still Alice and I’m not going to lie, I wasn’t excited to read it. My grandmother with dementia died not too long ago and reading a book about early onset Alzheimer’s disease sounded unbearably grim. It took me longer to get through than most books, but I’m glad I read it. While sad, it wasn’t nearly as depressing as I thought it’d be. I think what saved it from being maudlin was the way Genova set up the book. As readers, we’re in Alice’s head experiencing her humanity along with her diminishing memory. It’s too easy to write off people with mental illness in our society. We do it all the time to sufferers of depression, schizophrenia, bipolar disorder, etc. When Alice is starting to show symptoms, some of the people around her treat her like a leper, instead of the human being she is. It makes me want to rage, but on the other hand, I know I’ve done this in the past out of fear and ignorance. Mental illness is incredibly scary, so it’s nice to know there are stories like Still Alice out there that don’t sugarcoat the scariness, but still show the value and meaning in the lives of Alzheimer’s patients. Surprisingly, where I had issues with the book was its more technical aspects, not the subject matter. I wish this hadn’t been originally self-published and could have benefited from the suggestions of a talented editor. Genova has many strengths as a writer, but Still Alice’s main weakness was the lackluster dialogue. Almost every scene with significant dialogue I had to remind myself these people weren’t robots. My other nitpick is how Alice was treated by her doctors. I’m sure some people get lucky and every doctor that they see takes them seriously and gets to the root of their problems quickly, but that seems to be pretty uncommon. There’s plenty of documented research that says doctors don’t take women and their pain or medical problems seriously. So many women find out in their 30s and 40s that they have endometriosis because doctors told them the incapacitating pain they felt every month was just normal period pain. Do I think a woman entering menopause would be diagnosed as quickly with Alzheimer’s as Alice was? Hell. No. Still, I’m glad this book was chosen for me and made me go outside of my comfort zone. Share the post "Less painful than I thought it’d be"
Almost always running behind on reviews! How do I become a math hero?